Nothing can ruin your bliss more than slipping during a downward dog, or aching knees during a camel pose! Choosing the right yoga mat can mean the difference between a comfortable session and total frustration, and with so many available mats, finding just the right one can be trickier than a head stand. To help you find your zen, and the perfect yoga mat, we have put together this complete yoga mat buying guide so that you can easily decide on which type of mat is best for you. 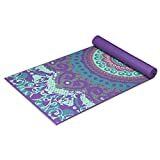 PVC Yoga Mats: Cost effective, PVC yoga mats offer practitioners the most amount of slip resistance. Widely available in an array of thicknesses, colors, and brands, these types of mats are ideal for beginners wanting to give yoga a try with minimal commitment. 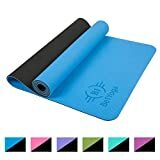 Rubber Yoga Mats: These are comfortable mats that make changing positions easy. Their smooth surfaces allow for more comfortable, quicker movements and they are great for yoga buffs that do faster practices with a lot of quicker movements where stability is key. Jute Yoga Mats: Ashtanga jute yoga mats are absorbent and eco-friendly. Offering intermediate users a more natural, environmentally friendly option that can handle high-impact disciplines and a lot of sweat, jute mats are suitable for Ashtanga, bikram, and other high-impact types of yoga. Cotton Yoga Mats: A natural option favored by many yogis, cotton yoga mats are very absorbents and eco-friendly and are usually the prefered mat for high impact yoga disciplines because of the stability they create for standing poses. Their absorbent nature also makes them an ideal choice for hot yoga classes. Thickness: Yoga mats that are thick enough to provide comfort and support during kneeling poses, yet are thin enough for users to be stable for balance poses are the top crowd pleasers. Choosing the right material as well as thickness is vital for getting the most use out of your mat, and buyers who have chosen quality mats over thicker exercise mats are much more satisfied. Traction: Traction is an important reviewing point, especially for users who practice hot yoga where more sweating is expected. They report that better traction will mean less slipping and making holding difficult poses much easier. 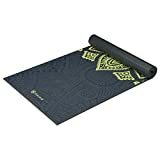 Choose a mat suited for your budget and needs and opt for buying a yoga towel if you will be doing hot yoga especially. 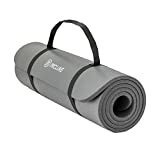 Durability: This is a particular concern for seasoned and frequent yoga practitioners, and mats that offer minimal wear and tear over extended years of use are rated much higher by reviewers. Price: Mats that offer quality materials at value prices are rated much higher by consumers. Choosing a mat material, thickness, and texture you want and then comparing prices on Comparaboo will ensure you get the best quality mat you want for the best possible price. How lightweight do you need your yoga mat to be? 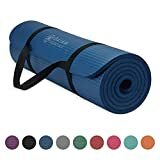 Yoga mats in general are portable but some are more lightweight than others. Cotton and jute mats are lightweight enough to easily carry to any class, while PVC mats offer more stability and weight for a comfortable session. 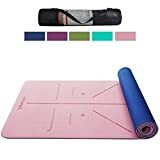 For home yoga or where not much traveling is needed, opt for comfort over portability; for travel and far away classes, choose instead a travel yoga mat that is easier to carry. As a beginner, you may not want to budget on a professional mat until you have given it a try, and opting for a beginner PVC mat will ensure you are not spending unnecessary. However, if you are looking for a long term investment or an upgrade, consider a longer-lasting rubber mat or a more absorbent cotton/jute mat that will give you a lot more hours of yoga for your money. If you are allergic to latex, avoid rubber yoga mats entirely. A good quality standard yoga mat is normally around ⅛ inches thick and travel yoga mats can be as thin as 1/16 inches for easier travel. Some mats can be as thick as ¼ inches which may make balancing difficult. Yoga mats should be thick enough for comfortable floor posing but thin enough not be too foamy that you sink into the mat, as this will cause stability issues. The texture of a yoga mat will determine how much traction the mat has. The more traction, the less likely you are to slide out of your pose. It will also determine how comfortable you find your mat and this varies from person to person. From natural fabrics like cotton and jute that offer the most natural texture and the least amount of slipping to smooth rubber mats, there is a texture to suit any preference. For extra absorbency and traction, think about buying a yoga towel that fits on your mat. Some mats even come with an included towel offering a more economical and comfortable 2-in-1 solution. Don’t forget to consider your height. Comparing your height to the length of the yoga mat will ensure it is perfectly fitted to you, no matter how tall you are. 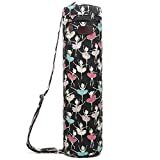 Other accessories you may want to consider when buying your yoga mat are yoga blocks and yoga pants designed specifically for yoga use, for more comfortable practice. 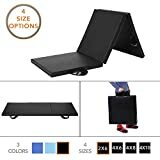 Black Mountain: Specializing in quality home gym equipment, Black mountain is known for their quality yoga equipment as well as their good customer service. Aurorae: Formed in 2009, Aurorae is a family owned business with products created by yoga practitioners for yoga practitioners. Known for their top rated yoga mats, they are a leading yoga equipment brand. Jade Yoga: Since 1970, Jade Industries have been supplying yogis with mats for years. They launched their modern Jade Yoga mats in 2002, and have been creating quality, eco-friendly mats designed against slipping ever since. 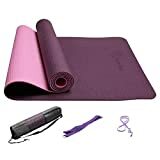 Yoga Direct: Importing and manufacturing yoga mats, Yoga Direct launched in 1999 and has become one of the largest producers and distributors of yoga equipment.